​In late 1998, both St Agnes Surgery and Tea Tree Surgery achieved FULL ACCREDITATION under the national accreditation program for General Practice which is administered by AGPAL. Our practices were the second in South Australia and in the first 40 in Australia to achieve such accreditation. Both practices are have been reaccredited every three years. In November 2016 both surgeries were assessed against stringent standards - both received full re-accreditation for a further 3 years to January 2020 - both surgeries received high praise for every one of the criteria assessed. Full Accreditation certifies that a practice has met ALL of the many standards set have been attained. Practice accreditation reflects standards in areas such as sterilisation, practice facilities, record keeping, staff training, accessibility and services provided. Accreditation is one method whereby patients can be assured of high standards and many Commonwealth government programs are only available through accredited practices. As well as being a fully accredited practice, all of our medical staff are vocationally registered General Practitioners. ​Vocationally registered GPs must undertake continuing medical education that is independently monitored by the Royal Australian College of General Practitioners over three year cycles. The combination of Practice Accreditation and Vocational Registration is one way patients can be reassured of quality. ​ "Accredited General Practice" logo. 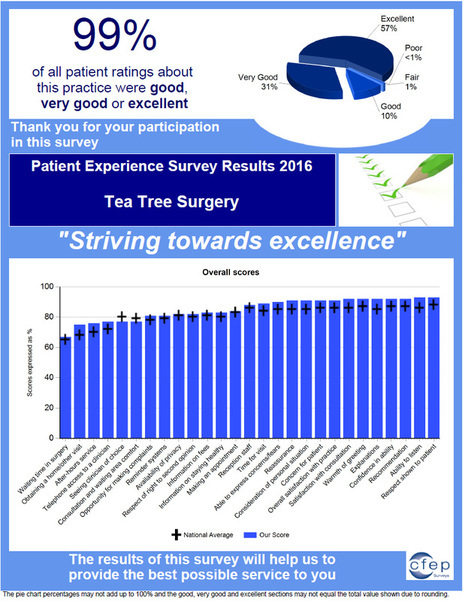 St Agnes Surgery and Tea Tree Surgery have completed the accreditation process for the triennium beginning 2017 and received high praise in all areas reviewed. This process included a survey of our patients. The results of these surveys are below. 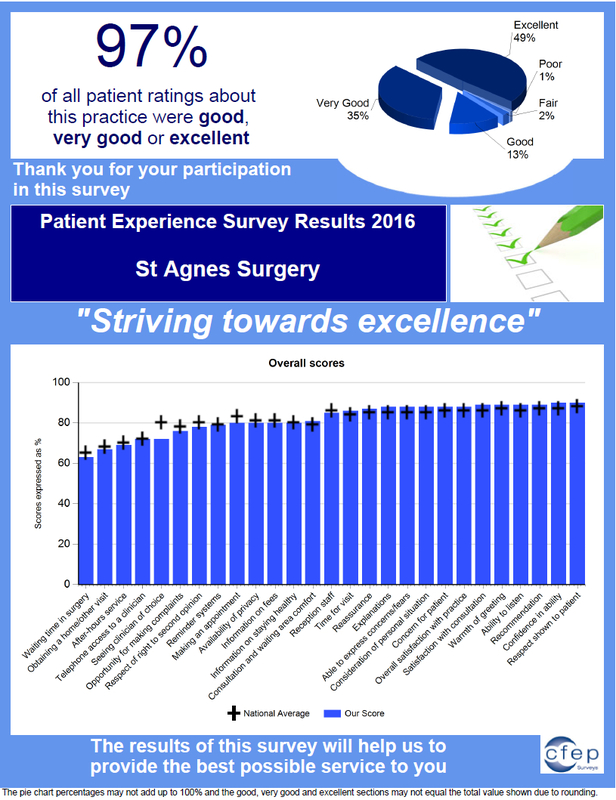 The Practice would sincerely like to thank our patients for the high rating that you have given us.